An 13th Century manuscript, thought to be the earliest surviving English roll of arms, is to stay in the UK. The British Library paid £194,184 for the Dering Roll, which depicts the coats of arms of medieval knights from Kent and Sussex. It was auctioned in December 2007 but culture Minister Margaret Hodge placed an export bar on the item. The British Library said the document was a vital record for the study of knighthood in medieval England. 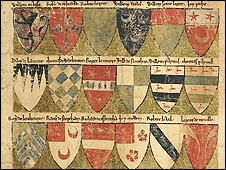 The painted roll of arms, which is about 2.6m (8.7ft) long, is thought to have been produced in Dover in the last quarter of the 13th Century. It contains 324 coats-of-arms beginning with two of King John's illegitimate children, Richard Fitz Roy and William de Say. Above each shield is written the knight's name. The 17th Century politician and Lieutenant of Dover Castle, Sir Edward Dering, erased a coat-of-arms on the roll and replaced it with one that bore the name of a fictional ancestor, Richard fitz Dering, in an attempt to forge his family history. Claire Breay, of British Library, said: "The Dering Roll was identified as a priority acquisition for the British Library, and we are very pleased that we were able to secure the funding required to purchase the Roll and keep it in the UK. "The acquisition of the Dering Roll provides an extremely rare chance to add a manuscript of enormous local and national significance which will greatly strengthen and complement its existing collection." The British Library received a £100,000 National Heritage Memorial Fund grant, £40,000 from The Art Fund and £10,000 each from the Friends of the National Libraries and Friends of the British Library to help buy the item. David Barrie, director of The Art Fund, said: "This is the oldest English heraldic manuscript known, and offers a fascinating insight into courtly life in the reign of Edward I. "It is also a very appealing work of art which probably arose from one man's attempt to prove the noble ancestry of his own family." The manuscript is currently on display in the Sir John Ritblat Gallery: Treasures of the British Library.